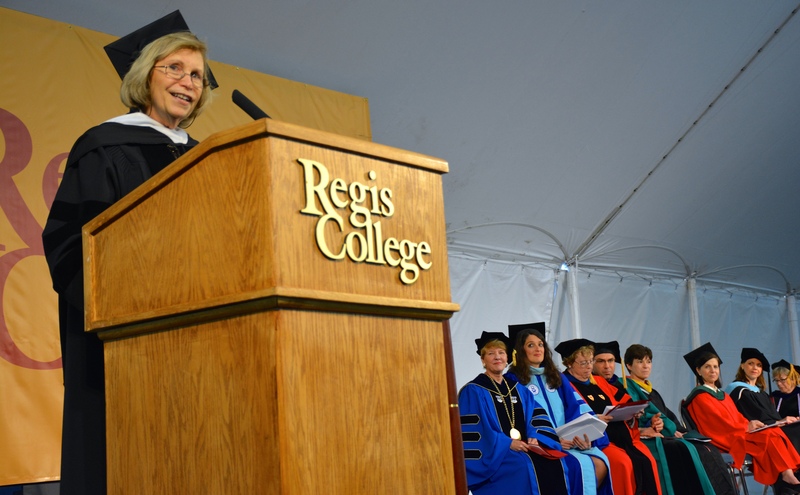 At the risk of sounding immodest, I want to share with readers how deeply moved I am to be receiving an honorary doctor of letters from Regis College, a dynamic and growing university in Weston, MA. Last night I was privileged to deliver an address to the hundreds of students receiving master’s and doctoral degrees. Entitled, “Donning the mantle of civic leadership,” the speech was an opportunity to urge graduates, even while working and raising families, to stay engaged in the news, remaining open to conflicting points of view and being willing to live with nuance and even contradiction. While touching on First Amendment rights and responsibilities, I also talked about loving language and not relegating their ideas and convictions solely to the 140 characters of a tweet. I link the speech here, and there will not be a pop quiz. I am always moved by commencements because of the accomplishments they signal and because, at these moments, all things seem possible. I am inspired by the energy and intellect of the younger generation, and reassured by its capacity to pick up where we left off and make things better. This entry was posted in Media, Politics, Uncategorized and tagged leading in a civic democracy, Regis College commencement, rights and responsibilities of freedom of speech, speech to master's and doctoral degree recipients, valuing the First Amendment. Bookmark the permalink. Thanks so much, Martha. I appreciate your comment!